In the year 2003 Aromale(Vinnai Thandi Varuvaaya) singer and malayalam Music director 'Alphonse Joseph's first Audio Released. The movie was Pritviraj Starrer "Vellithira". 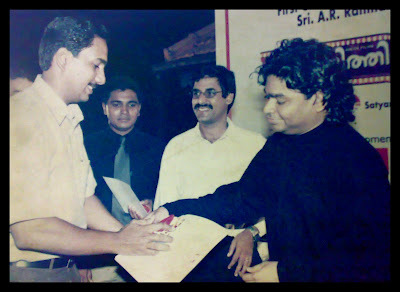 Alphonse is a Huge Fan of A.R.Rahman, so his audio released by giving first cassette to Music Maestro A.R.Rahman. Thanks to Liku for the image !